We can’t tell you the amount of times we’ve been asked if these gorgeous Night Owl Night Lights can be left behind after the party has finished! We use these night lights in a number of different themes and they are admired greatly! It is for this reason we’ve decided to now make them available for purchase. You can now purchase these Night Owl Night Lights for each of your guests. Your guests will be thrilled when they find out they get to take one home! The Night Owl Night Lights have a soothing, comforting glow at the press of a button! Press once for white light, twice for colour change and again for off. Give us a call if you’d like to add these to your order or simply add them to your Booking Request. 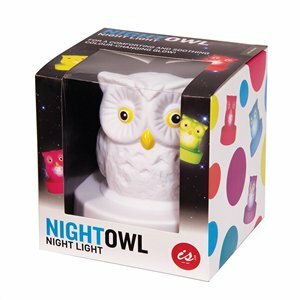 You don’t have to book a party in order to be able to purchase Night Owl Night Light. We know how popular these little guys are so if you want to purchase one, two or more, please give us a call and we’ll happily accept your order. Shipping fees apply if we post them out or you can collect from SleepoversRus HQ in Greensborough, Victoria at no charge.